In China, news reporters are known as the "crownless kings" on account of the powers of these unappointed and unelected members of the Fourth Estate. This is not necessarily complimentary, since kings are presumed to have unchecked powers. According to Ta Kung Pao, the book titled "Reports from the Frontline of Media" published by the Guangming Daily Press, "tomorrow will be even better for the reporters." 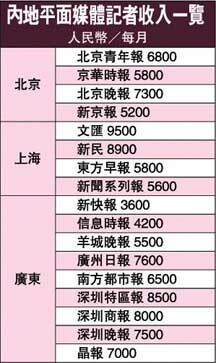 As examples, it was reported that a special page editor for Shanghai's Xinmin Wanbao makes more than 13,000 RMB per month, while the average salary of Shenzhen Special Zone Press reporters is 6,000 RMB. From this, it is not hard to see that the editors and reporters of the major urban media in mainland China earn salaries that would place them in the standard Chinese middle-class. A Beijing colleague described the salaries of media workers as follows: "5,000 to 6,000 RMB is no problem. Television show hosts and producers can even fight for more. The newest trend is that certain financial media big shots are talking about annual salaries of 300,000 to 500,000 RMB and the employees are not scared. The key is whether you have the right stuff." A Shenzhen reporter also said that when colleagues go home after dinner together, there is no need to ask anyone if they "have a car ride back home." He said, "Who cannot afford to buy a car in this age?" For this, we need to understand the salary history of Chinese reporters over the past few decades. In the 1960's, a university graduate entering Xinhua as a reporter earns 46 RMB. Although this seems ridiculous today, 46 RMB back then was enough to let a family of four or five live comfortably. Before 1949, the top newspaper in China was Ta Kung Pao and its salaries earned top salaries. According to the book "Old News From A Sea of Newspapers" by Xu Zhucheng, who had worked at both Ta Kung Pao and Wen Wei Po, he was making 300 silver dollars per month, which was enough to buy a house and support a family of 12 including the parents of himself and his wife. So who is the highest paid reporter in China? In 2001, 29-year-old Guangzhou reporter Li Xiang (李響) became an overnight sensation in China. Changsa's "Sports Weekly" made the offer of more than 1 million RMB for three months to recruit this female friend of former national men's soccer team coach Bora Milutinovic. That was the highest price for contemporary Chinese reporters. China Youth Daily exclaimed: "Li Xiang has set off a huge explosion in the fields of sports, economics, journalism and even sociology." Yet, as of today, Li Xiang is not longer worker as a reporter and the so-called "the highest price for a Chinese reporter" was as transitory as a rainbow. Why is the secret for a news worker to get a high salary? New York Times editor-in-chief Joseph Lelyveld responds: "You must open up a unique area for yourself." Using Li Xiang as an example, apart from effort and professional alertness, "you must see the news that others cannot." Beijing University graduate Li Xiang can speak fluent Serbian, and this endeared her to Milutinovic who had come from faraway. As another example, Economic Times' Wang Keqin is known as the top Chinese report on organized crime. Within one year, he managed to send more than 160 people to jail. The underworld gangsters once put up a bounty of 5 million RMB against him. The news professionals claimed he was the one who should be called "the highest priced reporter in China."